Although we were given no hope when our mentally and visually impaired child was born, we refused to believe that he could not grow mentally as well as physically. Despite his disabilities we were convinced that our son had as much right to life as anyone. As he continued to grow so did our family's distress and the predicaments we all encountered. How would this affect our family values and relationships? Our children's development in health, education and character? Our methods of discipline? We soon discovered that relying on a self-help approach was insufficient and decided to expand our resources and search outside the box to meet the ever increasing parenting challenges. We needed to depend on and learn from the advice of others facing similar challenges ... and ultimately have faith in our creator God. We initially wrote this book to share with others who are coping with a disabled child, raising a handicapped child or dealing with a visually or mentally impaired child - but then we realized that it can benefit and inspire anyone - because we all have hurdles and special challenges in life to overcome. Click here to Meet The Authors. If any of the issues above seem familiar; you have been seeking answers in similar situations; you have been facing other difficult challenges in your own life; or you can appreciate a good book that will motivate you to aspire to new heights, we are confident that you will benefit from - as well as enjoy - reading this book. We encourage you to learn more about The Little Boy That Could and Read Some Excerpts - or click here to Purchase Our Book Online Now. Mistakes You Don't Have To Make - Along the way we made a lot of mistakes and took many wrong turns, and our spirits and emotions would sink into the depths of despair - but there were also an equal number of successes and correct decisions that would lift us up in the glow of happiness. We mastered many valuable lessons and our faith in God strengthened and blossomed. This is ultimately a story of triumph and joy - demonstrating the amazing things that can be accomplished if you ignore the negativity, trust in God, follow your heart, think outside the box ... and never give up. Meeting Health Challenges - Of the many lessons we have learned, one that was exceptionally powerful for us was discovering the considerable influence proper nutrition has on both your mental and emotional wellbeing - in addition to benefiting your physical health. Like many people, when we first started out on this journey, we did not fully realize the true importance of a healthy diet and getting the proper nutrients. But now we do know, from our own experiences, how very crucial proper nutrition is to the overall wellbeing of every single person - no matter who you are or what your situation is - and we would like to share this meaningful information with you. Please click to get detailed information on Meeting Health Challenges. Something For Everyone - Even if you are not currently dealing with a child that is handicapped, disabled or in some way mentally, physically or visually challenged - this book is an honest, insightful, inspirational read for anyone, since almost all of us have been - or at some point in our lives will be - in a position where we will care for, teach or in some other way interact with a disabled person. Precious Memories - Be sure to browse our Family Photo Album while you are here. It illustrates many of the more memorable moments in our lives that have been described in our book. Each photo is captioned with the chapter and page on which the corresponding story appears in the book - so if you like, you can enhance your reading experience by visiting our website and viewing original photos of the actual events as you read about them. What A Deal! - We offer special group rate discounts to schools, churches, charities and other organizations that deal with and/or support handicapped, disabled or challenged children and would like to help their members, friends and community gain a better understanding of these children. You could hand them out or sell/auction them at a charity event to raise money. If you are a member of an organization such as this please visit our section on Group Discounts & Bonuses. "What an amazing story! And it's beautifully written too! 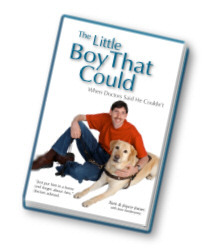 The Little Boy That Could is a book for anyone. It's a step-by-step 'how-to' for people facing similar challenges, while at the same time it's a story of overcoming incredible obstacles and defying the odds that will encourage and inspire any reader."